Haweswater converted to a reservoir is a very pretty reservoir in the beautiful valley of Mardale and is the most easterly of the lakes with no villages on its shores. The controversial construction of its dam was started in 1929 after Parliament passed an act giving Manchester Corporation permission to build the reservoir to supply water for Manchester. This decision caused a public outcry because the farming villages of Measand and Mardale Green would have to be flood therefore the population of the Mardale valley being relocated. Also the valley was considered one of the most picturesque in Westmorland and many people wanted it to be kept in its existing state. Before the valley was flooded in 1935 all the farms and dwellings of the villages were demolished as well as the centuries old Dun Bull Inn. The church was dismantled and the stone used in building the dam, all the coffins in the churchyard were removed and re-buried at nearby Shap. Manchester Corporation built a new road along the eastern side of the lake to replace the flooded road lower in the valley and the Haweswater Hotel was built midway down the length of the lake as a replacement for the Dun Bull Inn. The building of the dam, 470 metres long and 27.5 metres high, raised the water level by 95 feet and when the reservoir is full it holds 18.6 billion gallons of water. Haweswater is now one of the largest lakes at 4 miles long and half a mile wide and has a maximum depth of 200 feet. The reservoir now owned by United Utilities supplies about 25% of the North West’s water supply. It is one of the lesser visited lakes in the Lake District due to the lack of facilities and access via a single track road leading south from the village of Bampton. Mardale is also one of the more tranquil valley’s offering a number of walking routes with spectacular scenery. There is a United Utilities car park located at Mardale Head at the southern end of Haweswater a popular starting point for a path to the surrounding fells of Harter Fell, Branstree and High Street. A walk around Haweswater is about 10 miles and during periods of drought you may be able to see the buildings of Mardale Green, including stone walls and the village bridge that was flooded to construct the reservoir. 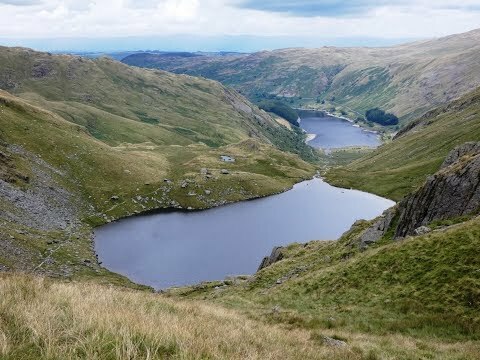 A direct path from Mardale Head up to Blea Water, the deepest tarn in the Lake District, is a shorter walk but a lot steeper, is a fantastic place for a picnic. Until 2015 Haweswater was the only place in England where a golden eagle was resident. A pair first nested in the valley of Riggindale in 1969 and the male and female of the pairing changed several times over the years during which sixteen chicks were produced. The female disappeared in 2004. The RSPB erected an observation post in the valley for people to see the lone male eagle which was last sighted in late 2015. The 20 year old eagle may have died of natural causes. Since 2012 the RSPB has leased two farms from United Utilities to be able to combine the improvement of wildlife habitats and water quality with running a viable sheep farm. Moorland and woodland habitats are also being improved for birds as well as the rare small mountain ringlet butterfly. Harter Fell forms the head of three valleys, Mardale, Longsleddale and the valley of the River Kent and its summit at 778 m (2,552 ft) lies at the meeting point of three ridges. The summit area of Harter Fell forms a horseshoe with subsidiary tops on both horns and is open to the east. As well as a pile of stones the summit cairn carries many pieces of ironwork salvaged from the fence which resemble upended pitchforks. A second cairn to the north is very similar. The views are wonderful all round but can be spectacular by moving to the rim of crags which will bring the full length of Haweswater into sight. The southern ridge passes over The knowe and then Brown Howe to connect with Kentmere Pike. The eastern ridge passes over the rocky top of Little Harter Fell and Adam Seat then continues down to Gatescarth Pass before rising to Branstree. The third ridge which starts lower down the fell-side is rockier and leads quickly down to Nan Bield Pass for a connection to Mardale III Bell and High Street. The western slopes above Kentmere Reservoir are quite steep, with an area of historic landslip surrounding Dry Gill. Below the crags that fringe the descending ridge to Nan Bield is the very attractive mountain tarn of Small Water. We go through the gate at the end of Mardale Head car park and take the track on the left sign posted Gatescarth Pass. We keep following the track uphill through two gates with Gatescarth Beck on our left. Just before the gate at Gatescarth Pass we turn right and continue to climb skirting Little Harter Fell until we come to a fence. We continue ahead uphill following the fence on our left and the cairns. The path turns left and we continue, now on the level, still following the cairns and fence line on our left to the summit of Harter Fell. We then follow the path downhill until we come to a crossroads of paths and a shelter in the dip of Nan Bield Pass. We turn right steeply downhill making our way to the left hand side of Small Water. We walk along the side of the lake and cross over Small Water Beck as it leaves the tarn. We now follow the path past some waterfalls back to Mardale Head car park. On this walk don’t forget to look back at some of the most superb views down into Mardale. This is a moderate walk on mainly gravel but some grass and stony paths/tracks. There are some steep inclines and declines. Approx 4 miles allow 2½ – 3 hours using OS Map OL5, The English Lakes, North-eastern area, Penrith, Patterdale and Caldbeck. This walk is done anti-clockwise. Start point: Mardale Head car park. Haweswater is south of Penrith in the north-eastern area of the Lake District. From the A66 at Penrith take the A6, Kendal road, and take the first right at Eamont Bridge to cross over the M6. Take the first left and follow this road through Asklam, Helton, Bampton and past Burnbanks. Continue following the road to Mardale Head with Haweswater on the right. The car park is located over the bridge at the end of the road. Parking: Free parking at Mardale Head car park. There no public toilets or refreshments en-route but the Haweswater Hotel, located half way along the lakeside road, has a walkers bar serving refreshments. The next nearest pubs are at the villages of Bampton and Bampton Grange, a shop at Bampton and a post office/shop at Askham. There is also a pub at Yanwath and a pub and shops at Eamont Bridge near Penrith. Penrith provides the nearest public toilets and many shops, cafes, pubs and restaurants etc to choose from.